The landscape, which is generated, is a modern interpretation of mediterranean space – which will also be expressed by the materials: mosaic, tiles, gridded-façade systems etc. 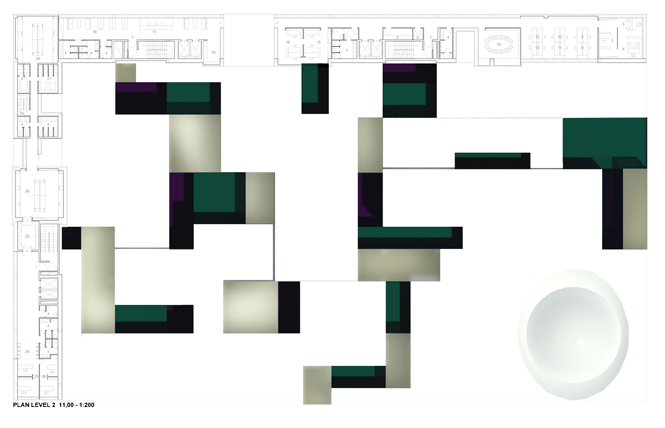 The project can be read as a single building ‘split’ in three parts: a “sockle”, a plateau and a block having two bars set in the shape of a L.
The two bars define the plateau rectangular shape. 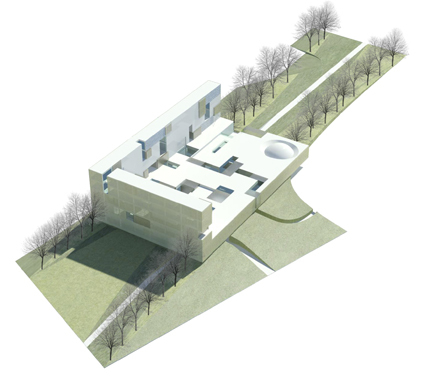 The North-West and the South-East sides of the building react differently to specific urban conditions in order to separate, to delimit and to open to desired views. The center’s various program units are arranged in the one-level plateau platform, a single layer of spaces and in the four-levels “L” shaped bars. At the upper level, on the north-east corner of the “L”, from inside the restaurant, once you visited the exhibit area, you may enjoy the sea view. The covered parking is arranged on the ground level in the “sockle” below the building. 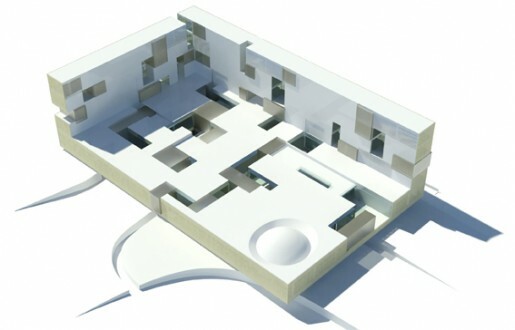 The main axis, coming from the Mosque and the metro station, extends into the “sockle”, gives access to the lobby, turning to emerge on the “plaza” inside the plateau to serve the functional areas. The “sockle” is an earth embankment dug up to obtain a series of voids in which set technical, emergency exits and small patios. Others parking stalls are in the south-east corner of the intervention area from where you get inside the park. 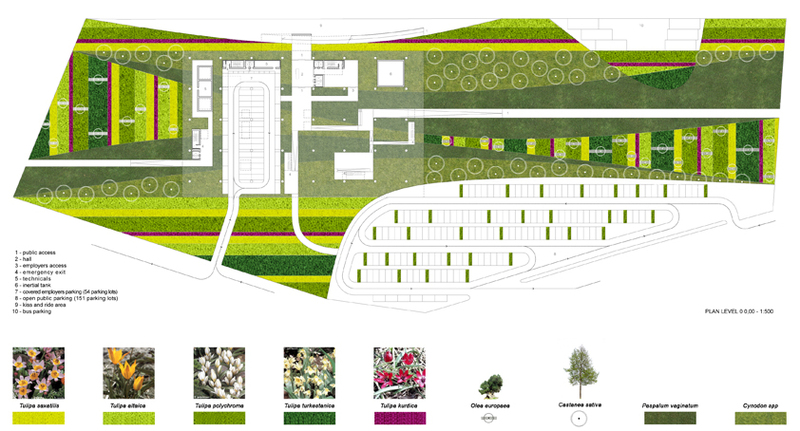 The landscaping consists in a linear park which textures evoque the image of the jaijim carpets. The park is referred to the Topkapi Garden with its axial sequence structure. The garden areas are arranged with native trees and local essences. Tulips, whose flower is the symbol of Turkey, is represented in many of its variety and planted in bands with different colors. All along the boundaries forest trees protect the building from the effects of proximity to major highways foresees from the development city plan. The park include spaces for outdoor exibitions related to the activities of the Center. 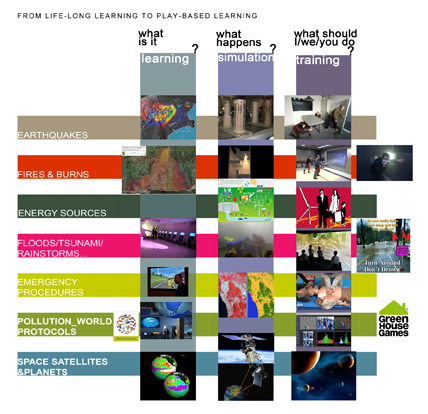 The Disaster Prevention & Education Center program aims to combine three different ways of getting data and display information: by learning, by training and by simulation experiments. Edutainment (educational- entertainment or entertainment-education) means to educate as well as to provide fun. This approach is motivated by the increasing demands on individuals for life-long learning and the need to integrate effective learning opportunities throughout life. It is the same as opposing: Uniformity_ Hierarchical / Multiformity_Un-Hierarchical. Multiformity can be obtained through typological re- invention, by grafting inside the assigned programme new meanings and new uses. Our first operation was to combine the series of program units, improving services, integrating new media facilities and establishing for each thematic section, the learning, the training and the simulation zone. This allow us to modify the given set of functions, transforming it into a mixed pattern of activities, increasing the potential to experience the functional program in a dynamic way, facilitating the visitor’s relationship whit the scientific contents. 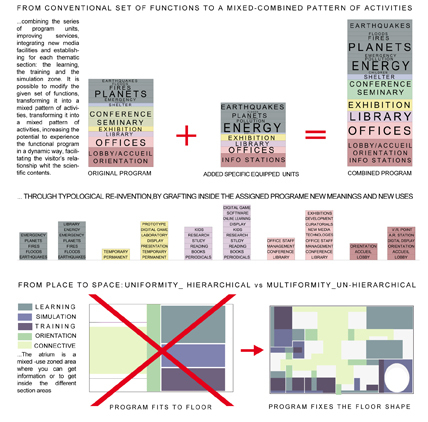 Un-Hierarchical means to avoid the organization of the program “according to floor”. We need to “enlarge” void space in which the thematic units are. Our strategy transform the traditional foyer in a “plaza” where you have not only the accueil facilities and the connectives but a true “big-eye” on the earth planet. The “plaza”, centrally located, is a mixed-use zoned area where a series of real- time interactive info-displays allows visitors to get more and more information about the disasters effects all over the world. The experience of the Center would increase in novelty and variety. We identify seven thematic sections (Space Satellites and Planets, Fires & Burns, Emergency Protocols and Procedures, Pollution & Ecological International Protocols/Strategies Floods/Landslides/Tornados/Tsunami/Rainstorms…). 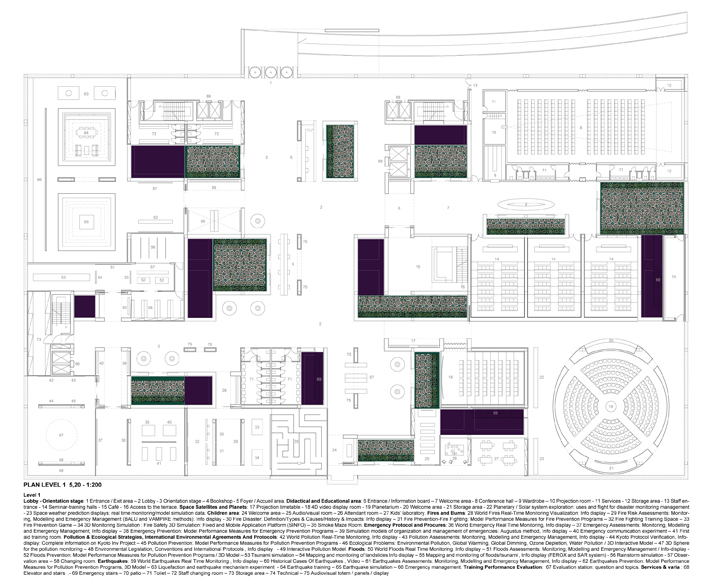 Each section corresponds to an area that is architecturally defined and equipped for dedicated performances, with varying size, flexibility, inner circulation paths. The educational spaces (kids, Seminar halls & Conference hall) occupy a part of the plateau. 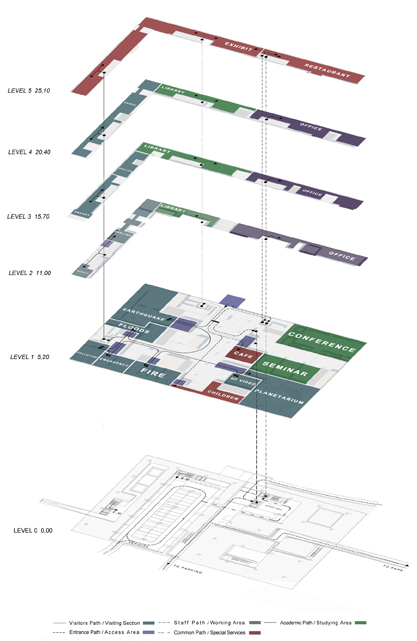 Offices, library, exhibition, restaurant, services are in the “L” bars. The emergency shelter is upon the seismic isolated structure on the first and second level of the north-west bar. THE BUILDING STRUCTURAL SYSTEM: In order to achieve a high degree of resistance to seismic events, and not too excessively overload the elevation structures , we have decided to isolate the building at basement level. The static scheme therefore provides a regular grid of squat pillars founded on footings and piles, which support, by seismic isolators, a rigid slab of 7m height, with a free internal height of 5m. Above the plate, on both sides of this, further elevation elements of 16m height are found as well as four functional levels. THE BUILDING ENERGETIC SYSTEM: The building’s air conditioning system is designed to drastically reduce its dependence on non-renewable energy resources. This objective will be achieved by an advanced air conditioning system, which will use up energy transfers inside the building by a mechanism of balanced water. The balanced mechanism will support the exchanger water/warter of small refrigeration equipment, which will be placed to serve climatically homogeneous areas. These machines will be powered by electricity, locally produced , partly by a trigeneration system and partly by a photovoltaic system that will be located over a shelter that is going to cover the ​​parking outside area (2000sqm / 260kWp). For the exchange of the secondary heat transfer fluid (balanced water) two distinct geothermal systems will be created: one with horizontal probes (which will be made using the earthworks needed to a plano-altimetric remodel of the Site: 16000mq) and vertical probes ( using as exchange elements the foundation piles of the building: 4200m). These areas of exchange, supported by a large storage tank, housed in the basement of the building (450mc) and by a fully automated control system, guarantee that heat exchange will always operate under extremely favorable situation, dramatically reducing energy needs of the building. THE ABSORBING/REFLECTING FACADE: our main concern throughout this project was the reduction of the energy needs of the building. For the south-facing facades of the building a system of glazed ceramic tile coating has been studied that achieves an outer coat with the function of interspace / ventilated wall . The terracotta tiles will be dry mounted on a support system that allows the creation of a cavity between the cladding and load bearing walls. The opening and closing of the interspace is controlled by a damper system operated automatically . The tiles are drawn in order to have a surface striped horizontally with corners defined by the project. The upper face of the stripes is painted to be highly reflective (silver), the bottom face is rough with a painting of a dark color (blue) highly absorbent mat. 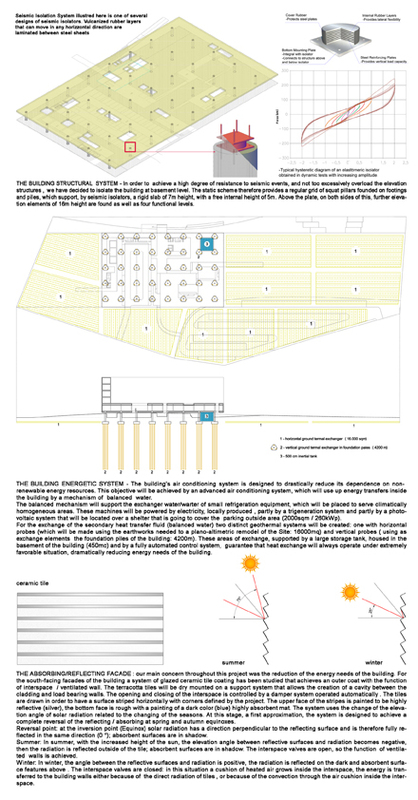 The system uses the change of the elevation angle of solar radiation related to the changing of the seasons. At this stage, a first approximation, the system is designed to achieve a complete reversal of the reflecting / absorbing at spring and autumn equinoxes. Reversal point: at the inversion point (Equinox) solar radiation has a direction perpendicular to the reflecting surface and is therefore fully reflected in the same direction (0 °); absorbent surfaces are in shadow. Summer: In summer, with the increased height of the sun, the elevation angle between reflective surfaces and radiation becomes negative, then the radiation is reflected outside of the tile; absorbent surfaces are in shadow. The interspace valves are open, so the function of ventilated walls is achieved. Winter: In winter, the angle between the reflective surfaces and radiation is positive, the radiation is reflected on the dark and absorbent surface features above . The interspace valves are closed: in this situation a cushion of heated air grows inside the interspace, the energy is transferred to the building walls either because of the direct radiation of tiles , or because of the convection through the air cushion inside the interspace.